Rental Why Waste Your Capital Dollars? OSHA COMPLIANT rigging system on the market!! RigReady-- - ANY BRAND-- ANY SIZE-- INTERCHANGEABLE!! QL-175 Boom system will fit on forklifts 2,000 lbs. to 17,500 lbs.  QL-400 Boom system will fit on forklifts 18,000 lbs. to 40,000 lbs. RigReady becomes a mobile crane for a road construction crew when used in conjunction with grab tongs to move cement road barriers around a road construction site. RigReady is a family owned business focused on offering quality rigging booms and building lasting relationships with our customers. We pride ourselves on our one of a kind product line and our outstanding customer service. We can answer all your questions about RigReady Quick Release Rigging Booms! Just Click Here for our contact information.